To round out the Red Sox position players, Jeremy and Jordan had to grade an eclectic bunch. None of the players spent the full year on the major league roster, but all will be receiving rings regardless. Some of these players were polarizing this season, but the end result is the same; the World Series wouldn’t have been won without them. After his monster April, I thought that we had another odd-even year problem for a Red Sox player. First Josh Beckett, then Rick Porcello, now Hanley. But the Sox shipped him out so fast that after cutting him some of his dreads might have gotten stuck in the doorway. He still gets a World Series ring and can enjoy the Dominican beaches and Cuban cigars, so I think each side benefited from this. After all, Hanley’s release paved the way for Steve Pearce, and we all know how that ended. That’s the only thing that salvaged his grade from a total fail. Jordan: I actually thought Hanley was given a bad exit in Boston. He had a great April and followed with a terrible May. It happens, and I recognize he was pitifully bad. But part of me was saying this team now needed to acquire a right-handed bat to platoon with Moreland… And I was right, but when they got Steve Pearce that took any logic behind keeping Hanley out the window. He had a great 2016 and was great in October in 2017, but overall his contract was another failure for the Ben Cherington regime. Jeremy: Who gives a rip about the prospect the Red Sox gave up to acquire Kinsler? I know one of our analysts does, but I sure don’t. Yes, I know Kinsler made an inexcusable error in the marathon of Game 3, but he was solid defensively all year up until that play, and the Gold Glove he won proved it. He contributed a little with the bat during the playoffs with a handful of RBI, but only one homer throughout his Red Sox career is anemic at best. All in all, I think Kinsler did exactly what the Red Sox brought him in to do. Shore up a hole in the middle of the infield by playing adequate defense, and bringing Boston another ring. Jordan: Kinsler is a tough one. Offensively? The dude was almost as anemic as Sandy Leon. However, defensively he looked better than Dustin Pedroia in 2010 and 2011 at times. People give him a bad rap because of that brutal error he had in Game 3 against the Dodgers –– but he still won a Gold Glove and had timely hits throughout his brief Red Sox career. He was by no means a great Dombrowski trade, but I’m uncomfortable saying it was a failure. Jeremy: I mean personally, I didn’t think that Lin should have made this list. Frankly, I was surprised that he played in 37 games; I couldn’t name more than five games I remember him in. The sabermetrics people seem enthralled with his improvements, but as an eye-test guy, I don’t really see it. He just seems like a Brock Holt-type player, but worse, and since Holt hasn’t priced himself out of Beantown there is no reason that the Sox should look to find a spot for him up in the big leagues. I see a trade chip that could be a throw-in when the Sox inevitably make another big acquisition. Jordan: The ‘Tzunami’, baby! I love Tzu-Wei Lin for reasons I’m not sure I can put to words. 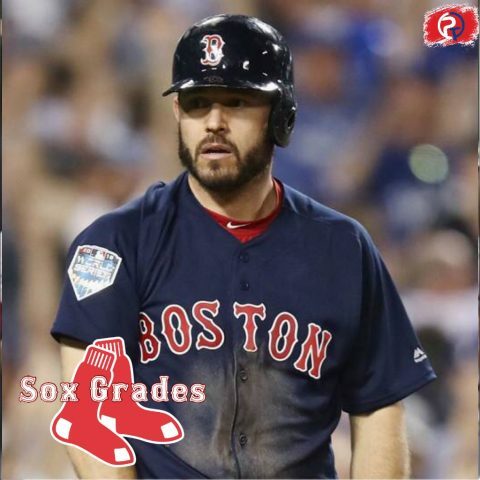 He was putrid his first stint in Boston in 2018, but actually made a case for himself to be on the postseason roster with his September showcase –– .381 with an OPS over 1.000. He was awesome, it just wasn’t enough. But overall, it’s tough to give a grade for a guy who played less than 40 games; and most weren’t meaningful ones. Am I excited about what he could bring in the future? Absolutely. But as for last year? I didn’t get enough.